optional: nuts, dried fruit, raisins, etc. Combine oil, honey and molasses in saucepan. Bring to a boil, and cook, stirring constantly, until honey melts; about 2 minutes. Add in 3 cups of oats. Mix well. Stir in remaining oats. Turn into large baking pan. Bake at 285 F for 20-25 minutes, stirring halfway through baking time. Let cool. Store in airtight container. Tracy, love your food blog. 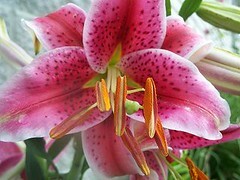 You have utensils in your title as I do at Oz Tucker at http://oztucker.blogspot.com. I am sorry to sound dumb and naive but is granola eaten like muesli - just add milk? It sounds yummy. And I love rolled oats. Yes, you just add milk, exactly like muesli! And welcome! Made this on Saturday - very tasty and so easy! Thank you! 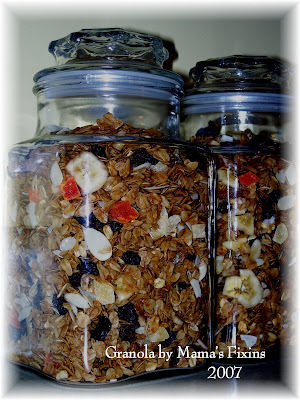 I made granola years ago, but stopped making it because it was time intesive. I like your recipe much better and plan to make it soon. Thanks for sharing it! could you make this without the oil and the molasses and just use the honey? You could curt back on the oil, but I wouldn't leave it out entirely. I've been using coconut oil in mine, and it tastes wonderful, and is healthier. As for the molasses, you could use brown sugar, or add extra honey, but molasses is quite good for you. I am going to be doing a Daniel Fast soon, which is only fruits, vegatables, beans and grains. No oils (except olive) and no sugars. Which is why I wondered about the granola! Thanks so much. you can have canola oil. You can make the granola with that, leave out the honey and molasses, and don't add any dried fruit except raisins. (The other varieties all have added sugar. You can add nuts, though! Making my second batch of this now! yum!